Competing in an industry where large companies have compromised reliability and trustworthiness as they have expanded across the country, MOR AIR INC. envisions a return of the higher level quality service experience customers will be able to depend on once again, “Quality service and repair.” Rather than move quickly through each job to prove efficiency, although efficiency is important, our aim is to appreciate the time with each and every customer as a time we can use to leave such an impression that we will not only gain retention for future services but we will be recommended to friends and family as well. 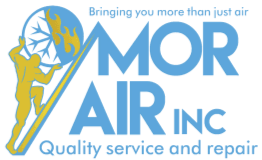 By following our motto, holding steadfast reliance in our value system and creating lasting relationships with customers, MOR AIR INC will become a household name. Integrity is the display of evidence that comes from consistently honoring our values. It is seen in our professionalism; calling ahead, arriving on time with a respectful appearance and courteous presentation. It is observed in the way our technicians regard the customer’s home and property, caring for it as much as or more than our own. Moreover, it is seen in the Quality of our finished product installations or repairs, where the machine is thoroughly serviced or repaired with great attention to detail, with no screw left loose or unturned and no issue was left unresolved, it is about providing the ‘full service’ experience. This virtue being commonly known as the best policy, at MOR AIR INC we list Honesty at the top of our values list for the positive effect that it has on human relationships-- it ensures that they last! Understanding this phenomenon, we maintain a straightforward attitude with our customers, clearly explaining costs and work that is performed, verbally and written. Helping customers understand details on products, on work performed or information on their existing machines will create a more comforting service experience. Too many stories are told by customers about big companies that exist nowadays who walk into a home with a salesman attitude. These companies only look at their bottom line profits and are set on convincing the customer to buy products and a whole new system from them before even making a sincere attempt at resolving the customer’s issue which could often just be a cheap, minor repair. 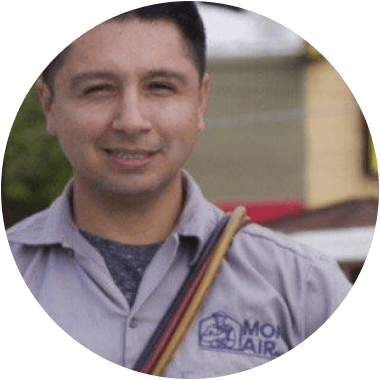 In contrast to these sales oriented companies, MOR AIR INC sets and maintains an ethical code of Honesty in order to ensure long lasting relationships with all of our customers and business associates. We value Passion as the best driving force for achieving optimal success. Passion moves us to advance our knowledge and stay current with information on the most innovative technologies we can bring forth to our customers regarding new energy efficiency standards as well as advancements in air comfort solutions. Passionately, we aim at excellence in every job we do with every customer we meet and this helps us consistently provide the quality service that is promised in our motto. Striving to become a household name, our passion is to bring quality with us as we exist for all of our customer’s AC and Heating needs.